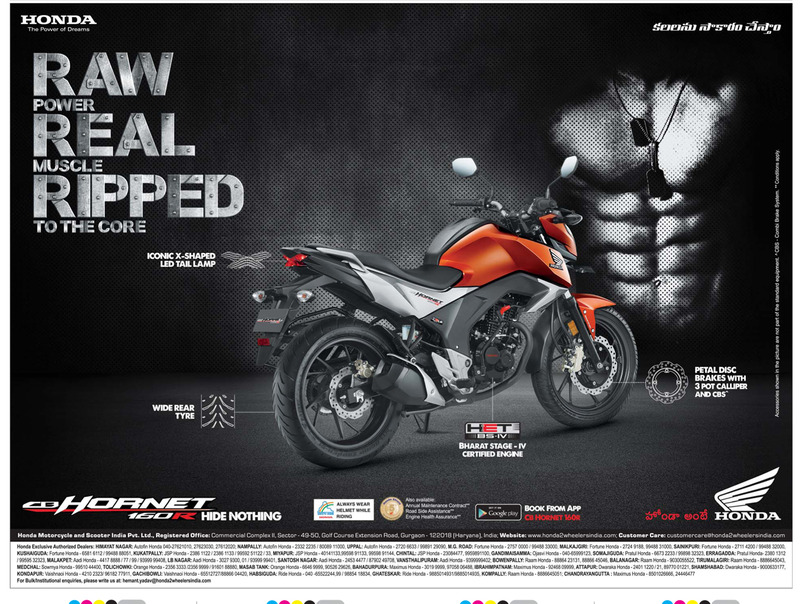 Honda: The power of Dreams introduces CB Hornet 160R with great features. Iconic X shaped LED TAIL LAMP.WIDE Rear Tyre. Petal Disc Breaks With 3 pot Calliper and CB's. Bharat Stage iv certified engine.. Visit website for more detials: www,honda2wheelersindia.com. customer care: customercare@honda2wheelersindia.com. This bike is available in India including all metro cities: Bangalore, Hyderabad, Mumbai, Delhi, Chennai, Kolkata, Pune, Ahmadabad, Lucknow and Jaipur. Conditions apply.